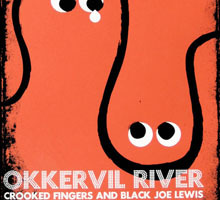 Okkervil River with Crooked Fingers & Black Joe Lewis silkscreen poster. 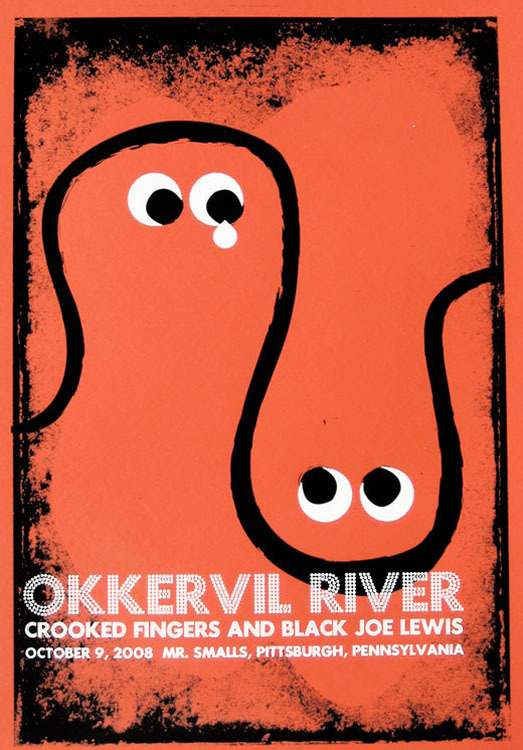 Hand screen printed poster for Okkervil River’s show on Thursday, October 9, 2008 at Mr. Smalls Theater in Pittsburgh, PA.
2-color, all hand screenprinted poster with black and white inks. Special features include a set of GOOGLY EYES (shipped separately) for you to goof with, for real. It’s pretty simple, really! Edition of 125. (I have only 25 available for sale! They’ll go quick!) Size: 16w x 22w inches. Paper: French Paper, Tangy-Orange, 100lb cover weight. Sorry! This poster is sold out. But! Try buying directly from the band here.